Posted July 13, 2017 by ReceivableSavvy. 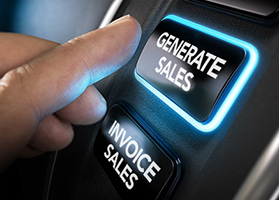 How your business is processing sales orders directly affects your Order to Cash process. If you are still stuck in an outdated, manual process you are at risk of ultimately driving down your overall profitability and customer satisfaction. Fully-managed automated solutions are specifically designed to save businesses time, and therefore, boost profits and customer service. One of the most time-consuming issues sales people and customers face is the vast amount of paperwork necessary to close a sale and ensure the best customer service. Sales Order Automation intercepts your customers’ orders, verifies they are correct, and enters them directly into your ERP system. This prevents the continual reentry of automatic information, like contact info, and the need for entering information into multiple areas for your internal software and your warehouse management system. The painstaking, repetitive task of data entry is taken off the shoulders of your busy customer service department, allowing them to spend their time on more rewarding tasks. Order automation integrates with your production-associated system, giving sales reps instant access to all important customer account information. Rather than spending precious time navigating through a plethora of paperwork, your sales team can focus on providing best quality of service to your customers with all the information regarding their account at the sales rep’s fingertips online.